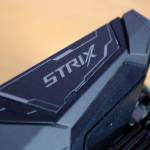 Today we will be taking a look at the Speedlink Regger Gaming Chair. Working our way up to our comparison article, this is the next one up! 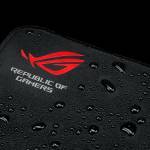 Speedlink has a wide variety of products they manufacture aside from the Regger, they also have PC Peripherals, speakers, console accessories and more! While I have personally seen a few products from them previously, my favourite has to be the QUINOX gaming controller. 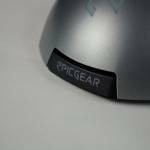 As with all Speedlink products, it had great performance, function and was at a very respectable price for what it had to offer. 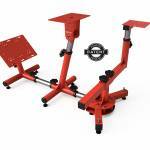 Speedlink is known for offing products with loads of features that won’t cost the earth. 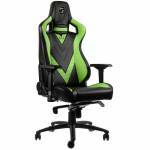 The Regger has been out for awhile now and compared to some of the other chairs we have seen, it comes in noticeably cheaper while looking very similar. 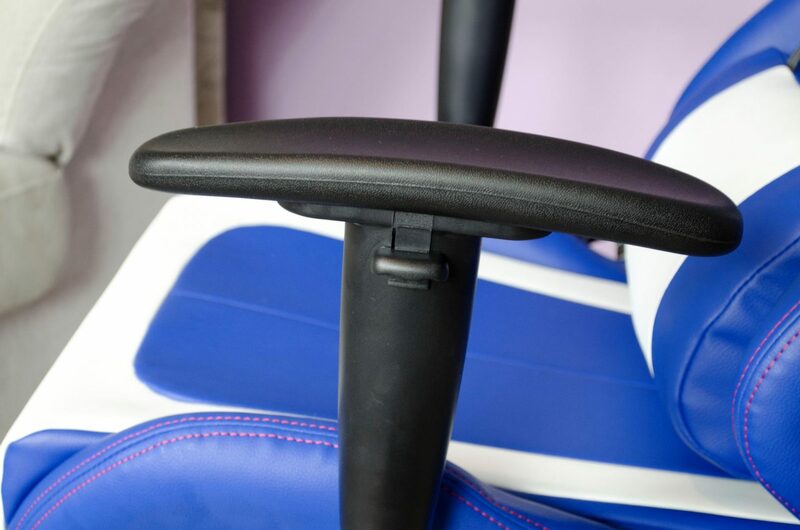 The whole basis behind ‘Gaming Chairs’ is to offer an aesthetically pleasing chair that will also help with posture. 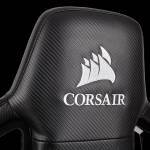 A lot of gamers spend far too much time sitting on their butts and need a chair that is up to this task. 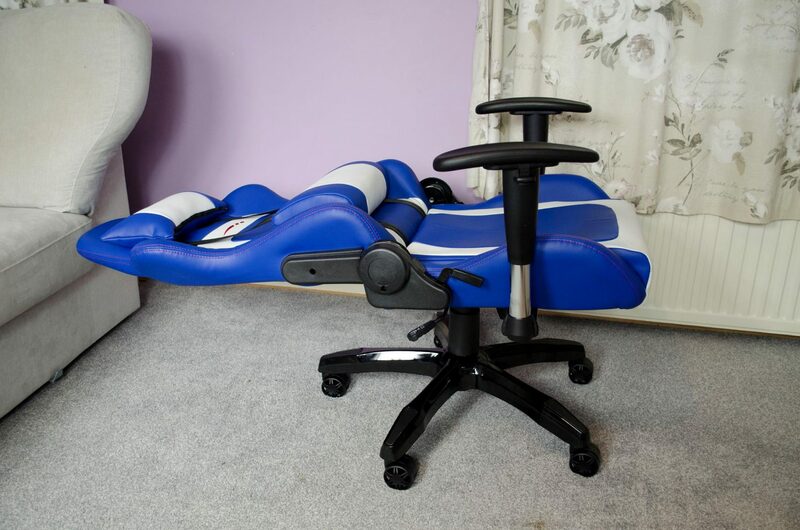 Anyone that has ever used a dining room table chair will know they just don’t cut it for proper gaming or working sessions when on the PC. 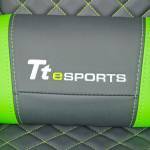 That is where Gaming Chairs come in as they offer users the ability to sit for longer while helping with posture and providing comfort. 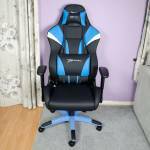 While not all gaming chairs are built equally, a lot of them are very similar and that is where this review comes in. 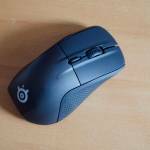 Let’s see some quick info on the Regger and then get into the review! I couldn’t be bothered to show you the whole unboxing as the box is absolutely huge. However, this is everything that is inside the box. If you’ve never put one of these together, please don’t worry as we will cover that as well and it is quite easy! 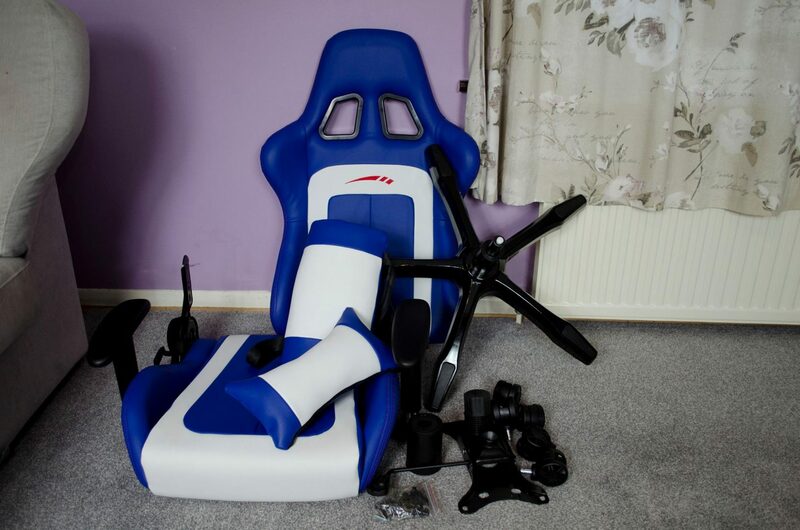 Putting a gaming chair together isn’t as hard as it looks. I’ve put a good 12/13 together so far myself and have kind of sorted out my own way to do it. There are a couple of ways to do this properly and they should all yield the same end result so don’t worry too much if you end up doing things a bit differently. 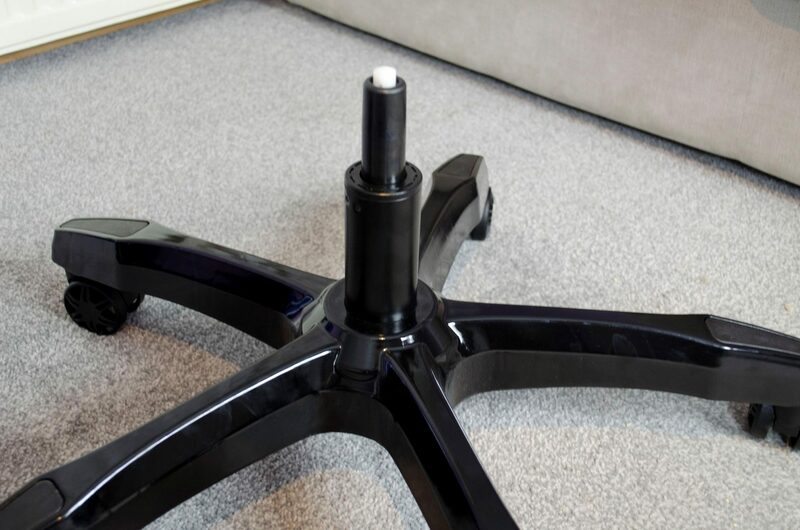 To make life easy, I always start with the 5-point base and insert the casters into their designated holes, then I flip the base over and put the gas lift and its cover into place. Next, I attach the backrest to the bottom seat. You could attach the seat part to the 5-point base first but then that allows the chair to turn on you which can get quite annoying hence why I do it this way. Once the back is on, I install the tilt mechanism to the bottom of the seat. It is important to make sure you install this in the right direction, you want the hole for the gas lift to the rear of the chair and the big knob you turn towards the front of the seat. We’re almost done! 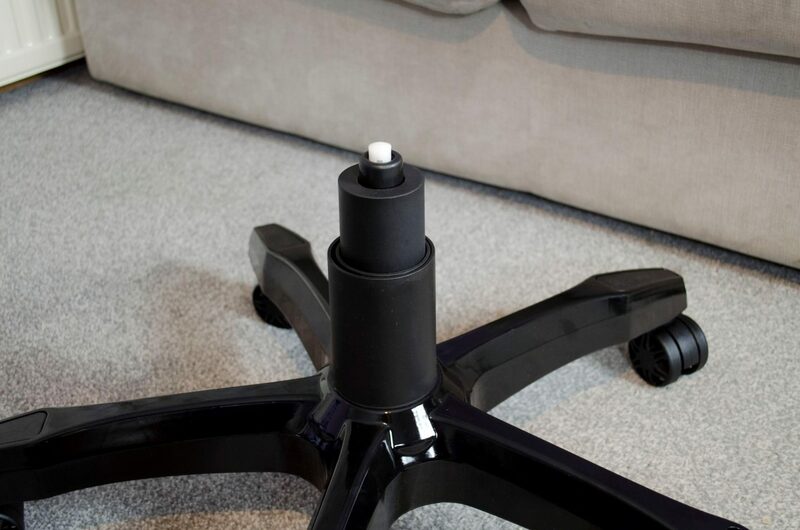 Now you can install the gas lift into the chair. I used to try and lift the chair up and set it down on the gas lift but I’ve found doing it as below to be much easier. 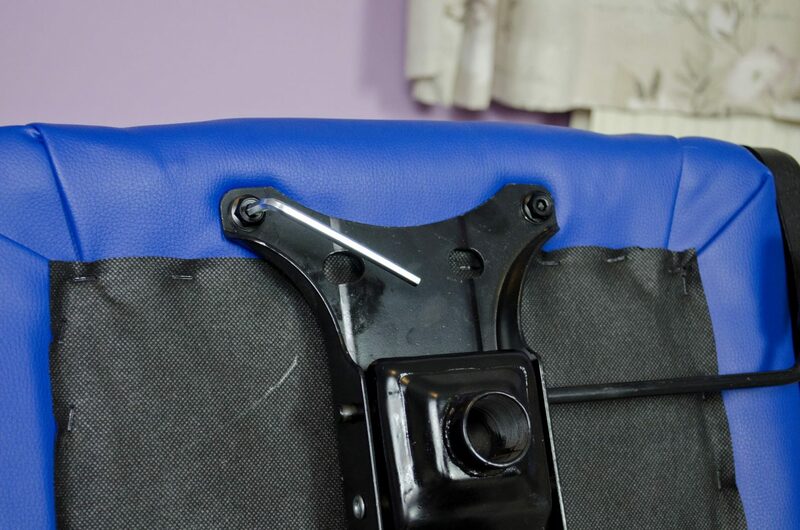 If you do it this way, once the chair is flipped upright, do make sure to push down on the base quite hard to ensure the gas lift has been properly inserted into the bottom of the chair. You could put these covers on once you’ve attached the back of the chair to the bottom seat but I like to wait until last to put these on. The reason being is just in case you need to make any adjustments to the bolts they cover, you won’t have to take it off to do so. The Regger comes in a few different colours such as blue, red, yellow and black. Speedlink obviously did their homework before they sent our sample in which is always great to see. The Regger comes with a pair of pillows, designed to help provide extra support in the lumbar and neck areas. These pillows can be easily removed for those that are not fans. However, I will say this, give them a good try as with my first Gaming Chair I couldn’t stand them but now I do prefer using them. 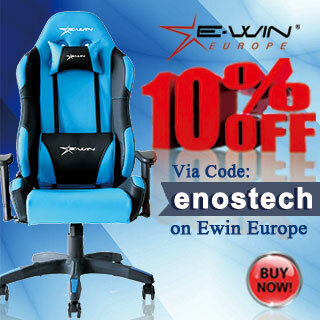 They offer users who like to slouch a bit easier way to have better posture. 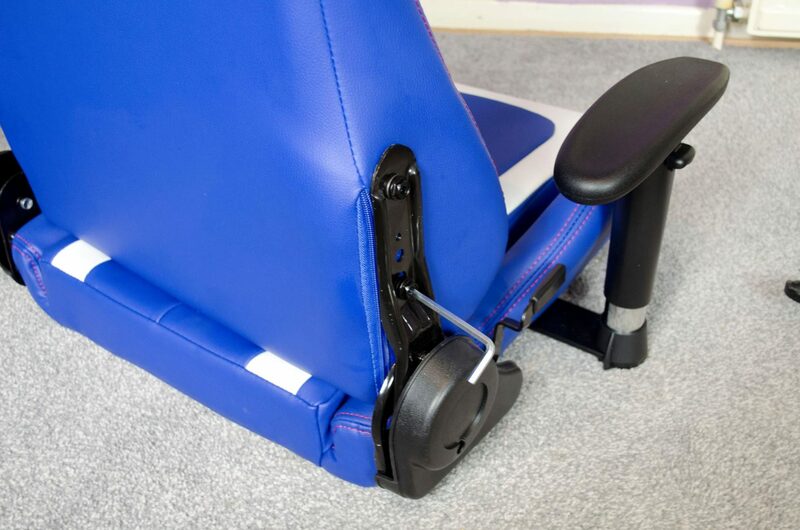 The arms rests can be lifted up and down all by simply using the button on the outer side. This is one of the small features that help to make the Regger cater to a wider variety of people. I find myself about average/short in height and I like to have my arm rest all the way up, those who may be a bit taller may prefer to have them all the way down. To find out where you want your’s you’ll have to try one out and find out for yourself. 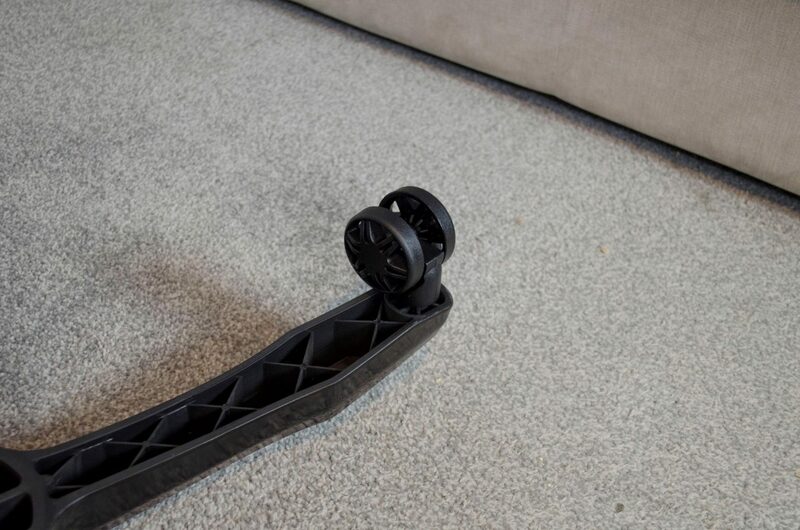 The Regger not only tilts back and forth, it can also recline back so you can lay flat on it. 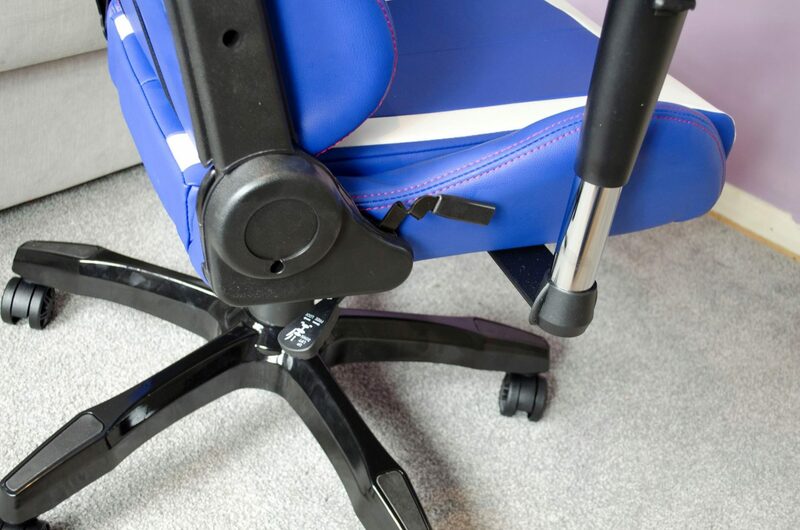 There are two levers to control these features on the right side of the chair. The lower one with the writing on it controls the tilt lock function and can also be used to raise or lower the gas lift. The lever right next to the seat of the chair is the one you will pull when you want to recline back. While it can be a bit scary going all the way back, I can say that it takes more than a 200lb man to tip this chair over backwards when reclining all the way back, even when he is trying to tip it over! As you can see, the chair goes all the way back and could come in handy for a number of things, such as napping while at the PC! One thing that we see a lot on the 5-point base is a bit of added protection or a place to rest your feet. 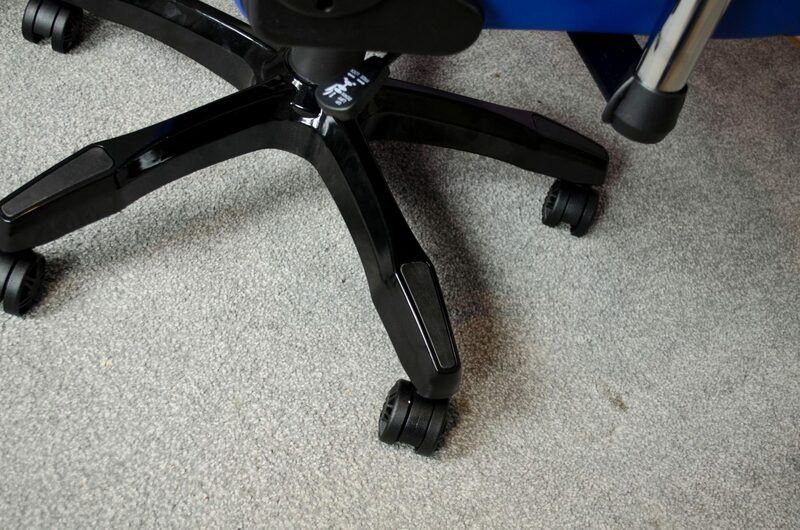 By nature, a lot of people rest their feet on the base of the chair so companies are offering up some little tweaks to make this more comfortable and make sure the chair itself doesn’t get worn down from this. 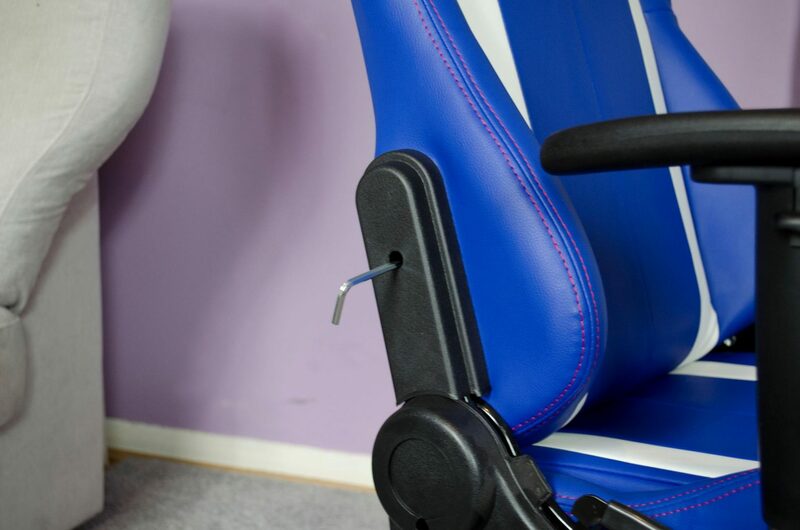 Overall, the Regger has a lot going for it, it looks quite nice, comes in a few different colours and has the necessary features that we would expect to see in a gaming chair. 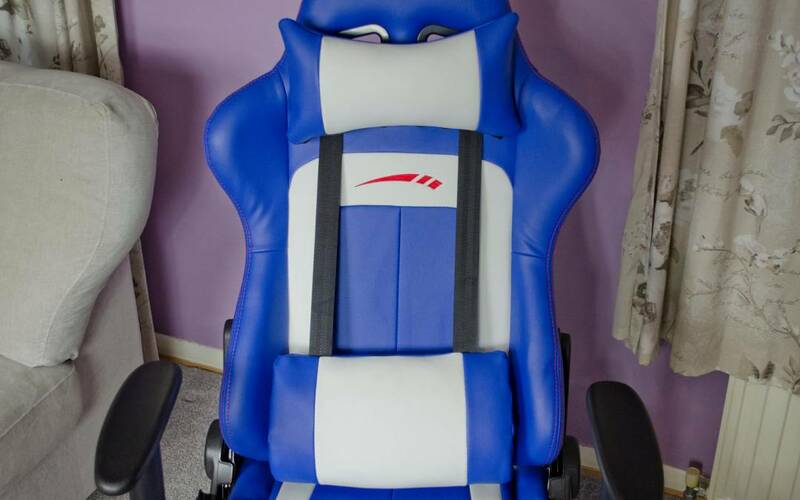 I used the chair for a good couple of weeks and have to say, it does the trick! Enough of all that, though. Let’s take one last look at the Regger and go ahead and wrap things up! As mentioned, I have used the Speedlink Regger for around 2 weeks as my daily chair which consists of a couple hours use in the morning and a couple more in the evening/night time. I think the most time I spent in the chair was around 6-hours or so one day, obviously getting up for drinks and toilet breaks etc. Now, the time has come for me to give me final thoughts on the Regger. 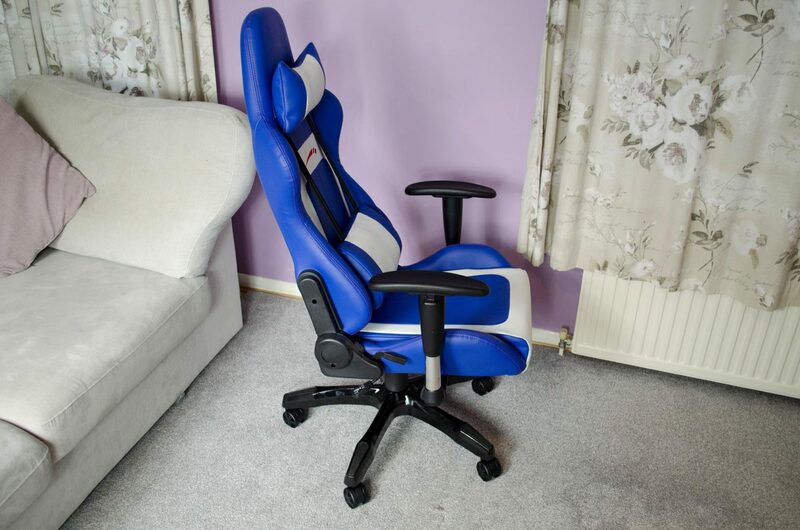 This chair is a bit smaller than some of the others I have tested recently and while this doesn’t cause a problem for me, it was definitely noticeable. The Regger was able to provide me with hours of comfort and stability when at the PC. The cushioning was soft and comfortable, yet firm enough to not be misshaped easily. With the added pillows, I find sitting up straight for longer periods of time much easier. Not only does this provide better comfort at the time but also in the long run of things. 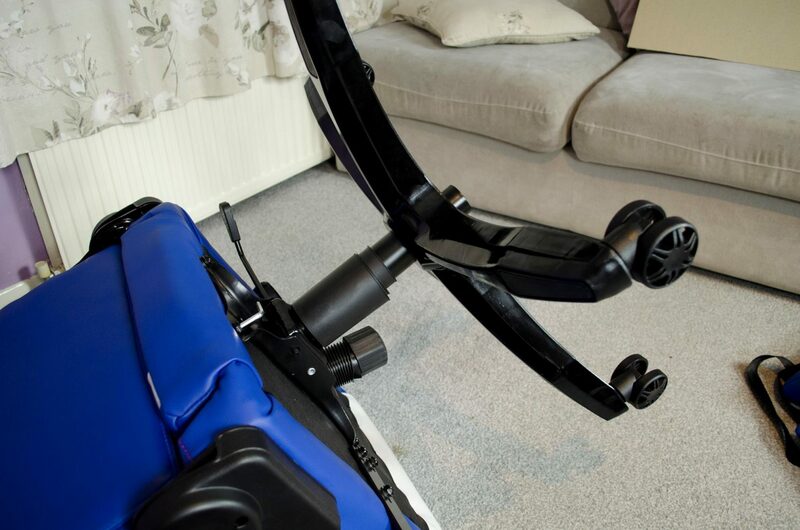 The raisable arm rests alongside the tilt and reclining functions help to make sure the Regger offers a comfortable position for a variety of different size people. 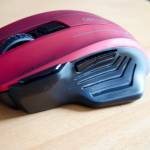 It is also worth mentioned that Speedlink has done a great job at keeping costs down while not cutting too many corners. While the chair may not be the most feature rich, it has the main features that matter and is comprised of decent quality materials. This is going to help the Regger quite a bit. 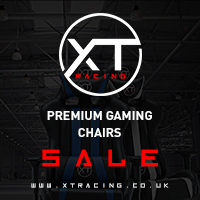 Coming in cheaper than a lot of other similar gaming chairs, the Regger being a bit more easily affordable should help it be a more viable option. 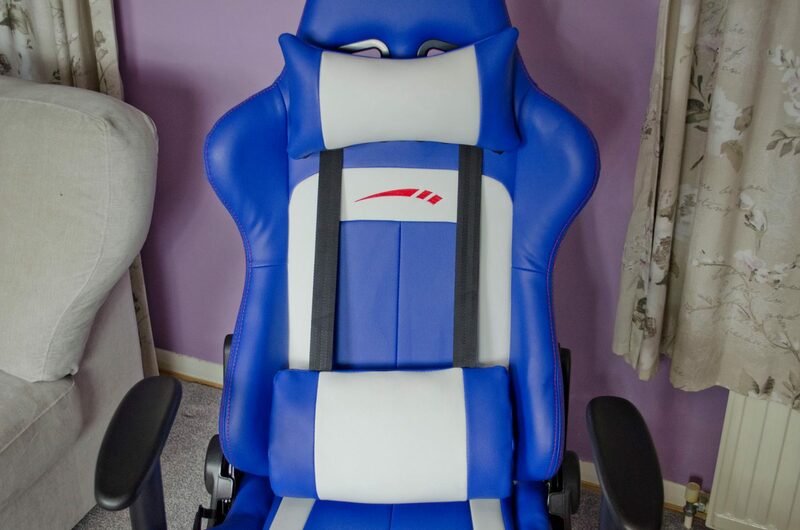 Coming in just above £170 this puts the Regger a good £50-£100 cheaper than some other similar chairs which also allows it to offer very good value for money. 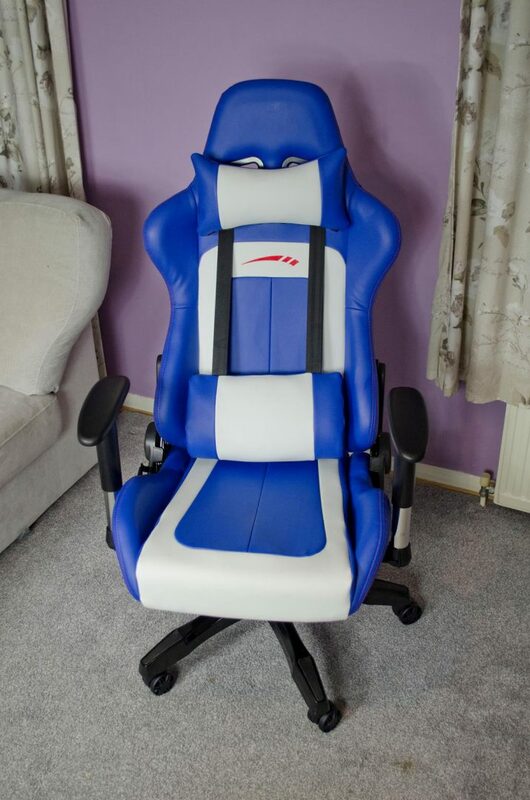 All in all, the Regger is a decent chair at a very decent price and if you are looking into a new Gaming Chair, it is well worth having a look at and considering. 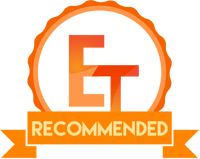 Many thanks to Speedlink for sending in their Regger Gaming Chair for this review!